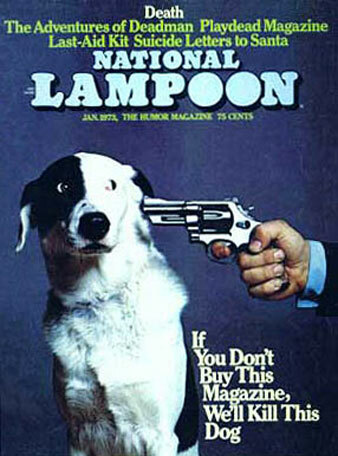 Remember the National Lampoon cover showing a puppy with a gun to its head? That's the Paulson plan. If it’s a bailout, somebody had better get a larger scoop. In the immortal words of basketball player Micheal “Sugar” Ray Richardson, “the ship be sinking”–or at least it is taking on water faster than Secretary of the Treasury Henry Paulson is able to bail it out. The prices of stocks have been flying up and down as though they were on methamphetamines. On Wall Street itself there has been a near-riot by firms who are frantic lest their “toxic waste” is not bought up by Paulson and hauled away to wherever it is that he eventually puts the billions of dollars in currently worthless collateralized debt obligations (CDOs) and collateralized mortgage obligations (CMOs) prior to their final disposition. Market stability can not occur when thousands of people every week are losing their homes. As long as the defaults and the foreclosures keep coming, the price of housing will melt, and as it melts more bonds, more CMOs and more CDOs will turn toxic and more money will be needed to buy them from the greedy guts financial institutions holding them. How long this lugubrious and expensive form of tail-chasing can go on is anyone’s guess. Mr. Paulson could be back for a second helping after the first $700 billion is exhausted because the Big Buy Out does not address perpetually falling real estate prices, and with this mess it always gets back to the price of real estate. With every new foreclosure one more house goes back on the market to depress prices. As long as more houses are thrown on a market which cannot absorb them, Paulson is on a treadmill to financial oblivion. Not quite oblivion. Some day, somewhere, a loud thump, the sound of the real estate market hitting bottom, will reverberate across stricken Southern California, Florida and Michigan, but that moment could be a couple of years and a couple of trillion dollars away. Long before that day comes, Paulson and his co-workers have something else beside their markets and their world of finance to reckon with. It is dawning on millions of people that this huge sum of money, money that might have gone for healthcare or education or the environment, this gigantic sum is going to save Paulson’s erstwhile fellow executives in the securities industry. Paulson, who has made an estimated half to three-quarters of a billion in the industry he is struggling to maintain, has a political tin ear. He not only is demanding hundreds of billions from Congress but wants it with no strings attached, no court review. His is a give-me-the-money-and-go-away proposition–and it is going over well. His colleague Ben Bernanke, the chairman of the Federal Reserve, also is demonstrating that he is more academic economist than politician. He is arguing that the government ought to buy the toxic waste at above-market prices, thus lessening the chance that the taxpayers will eventually break even. The accumulation of insistent requests from these men is igniting a firestorm in the country. The rentier class, at least the plutocratic part of it, has made what looks like an ultimatum to the country, and people are not buying it. Either Paulson’s proposition is drastically modified with such things as curbs on CEO pay and government equity in the companies receiving handouts, or there may be hell to pay. The anger and indignation is there for a national necktie party.